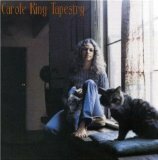 Dr. Rock's Blog & Roll: Album of The Day: Carole King (2/10/71) 39 Years! Album of The Day: Carole King (2/10/71) 39 Years! Carole King (click here for Dr. Rock’s playlist) had already established her credentials as a top-notch pop music songwriter by the time her second solo album, Tapestry was released on this date in 1971. As a member of the acclaimed Brill Building team of song crafters, King’s work (most often in collaboration with future husband Gerry Goffin) had been covered by numerous top acts throughout the 60s and early 70s, including the Beatles (“Chains”), the Monkees (“Pleasant Valley Sunday”), Little Eva (“The Locomotion”), the Shirelles (“Will You Love Me Tomorrow”), the Chiffons (“One Fine Day”) and Aretha Franklin (“[You Make Me Feel] Like A Natural Woman”). Tapestry came at the beginning of the singer/songwriter boom in the early 70s and ultimately proved to be one of the seminal releases of the genre. Well-crafted, minimally-produced, warm, resonant and introspective, it ruled the US Pop charts for 15 weeks and included the #1 singles “It’s Too Late” and “I Feel The Earth Move.” In its day it was the longest charting album by a female performer and (rightly so) is one of the highest selling pop albums of all time. Tapestry is available for purchase as a CD or download as mp3 files on Amazon (click here) or as iPod downloads at iTunes (click here).